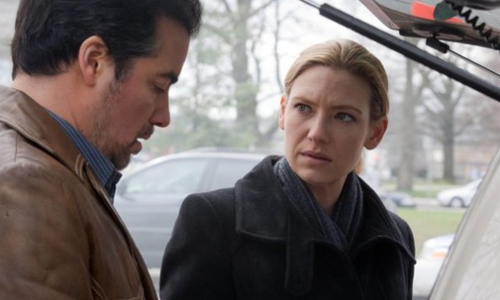 Cultural Wormhole: Fringe - "The Last Sam Weiss"
Sam Weiss (Kevin Corrigan) helps Olivia Dunhamn (Anna Torv) get an artifact of the First People. What?! And there's still one more episode left in this season?! Take it easy on me, 'Fringe'! I don't think I can handle this intensity! "The Last Sam Weiss" certainly had the punch and ending of a classic season ending cliffhanger, but the showrunners aren't done yet. The twist at the end was of the sort that left me completely off guard, because I never saw it coming. While there have been rumors and theories about a third (commonly refered to as the "Yellow Universe") parallel world, I think the writers had a little fun by building up our expectations and then throwing a huge curve ball at them: time travel. Yep. Peter stepped into the Machine and had his conciousness shot into his future self's body, about fifteen years. Notice that his hair is graying which indicates that Peter's body did not travel, only his mind. Nice twist there, since we've already dealt with people interacting with their dopplegangers enough this season, we don't need to complicate things further with young Peter and old Peter running into each other. As the episode hints, we finally get some actual background into Sam Weiss. He's not ancient, it's just that he is the last in a long line of men that have studied the First People and have passed on that knowledge to their sons, all named Sam Weiss. An interest injection into the show's overall mythology. The First People, like the Observers, are still clouded in mystery and I hope we start getting some answers about both in the coming season. Once again, the writers are drawing upon material from the first season and using it to flesh out some of the current plot threads. I don't know that the creators had Olivia's ability to switch off the Machine in the Redverse when they wrote her telekinetic bomb disarming scene in "Ability" way back in season one, but it the pieces fit smoothly together. This will make going back and rewatching the entire series all the more exciting. One more episode to go in season three. After the ending of "The Last Sam Weiss" it better be a doozy, because the cliffhanger of this past Friday's show was a homerun.